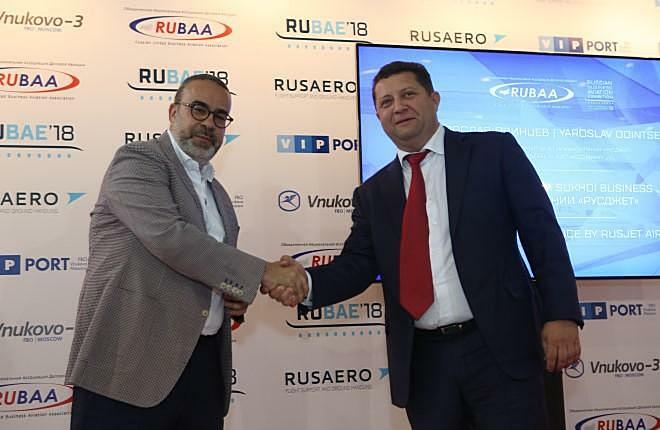 Russian aircraft manufacturer Sukhoi Civil Aircraft Co (SCAC) and RusJet Airlines have signed an agreement to jointly promote the Sukhoi Business Jet (SBJ), the VIP version of the SSJ100 regional airliner. Under the agreement, which was revealed at the RUBAE 2018 business aviation event in Moscow this week, the Russian operator will help SCAC with SBJ (known also as SSJ 100LR VIP) marketing and sales. RusJet chief executive Yaroslav Odintsev commented that his airline will be assisting the manufacturer in searching for potential customers “within a mutually beneficial partnership.” RusJet will also walk future customers through the entire acquisition process, providing assistance in matters such as the choice of cabin configurations and the hiring of crews etc. Odintsev added that the carrier is willing to share its experience of operating the single SBJ which has been flying for RusJet since August 2015, clocking between 60 and 70 flight hours a month. The operator is planning to lease two more of the type from State Transport Leasing Corporation (GTLK), Odintsev revealed to ATO Show Observer, Russian Aviation Insider’s sister publication. The airline is looking to add the aircraft to its fleet in May or July 2019, he said, adding that RusJet will opt for a cabin configuration seating 19 passengers. Seats will be sold either individually or in bulk for corporate charter needs. Today, apart from RusJet, the type is in operation with Rossiya Special Flight Squad, Comlux KZ (on behalf of metallurgical corporation Kazakhmys), Kazakhstan’s border patrol and the Royal Thai Air Force. Currently, the collective fleet stands at 11 units. The target markets for the type are CIS countries, Middle East, south-east Asia and Africa. The aircraft, which SCAC believes occupies the niche between heavy business jets and VIP-versions of airliners such as ACJ and BBJ, is priced between US$45m and $49 million. Russian Federation, Moscow, Vnukovo-3 Airport.